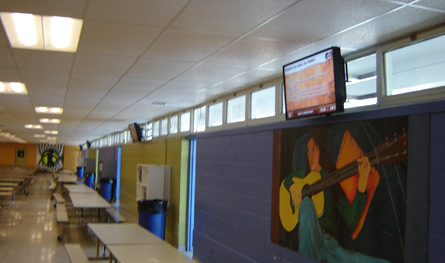 École Secondaire Hormisdas-Gamelin, a public high school in Gatineau, Québec, has engaged Mirada Media to install digital signage in their high-traffic areas. 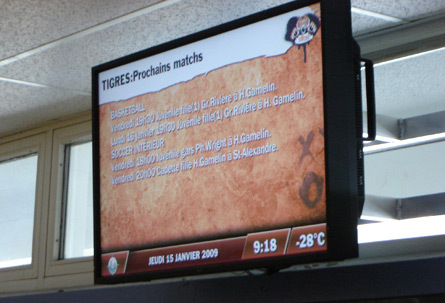 Montréal, February 5, 2009 – Mirada Media, a leading provider of digital signage integration for the province of Québec, is pleased to announce the recent installation of its ChannelView system at Hormisdas-Gamelin high school, located in Gatineau, Québec. The project marks Mirada’s entry into digital signage integration for the education sector. Hormisdas-Gamelin needed a medium through which it could complement its oral announcements and reduce paper-based bulletins, as well as a means to increase the effectiveness of its communications to the over 1600 students who are enrolled at the school. With these objectives in mind, Mirada installed its ChannelView digital signage system with five commercial-grade 40-inch LCD screens at Hormisdas-Gamelin. Four of these screens are located in the cafeteria, where virtually every student will be able to view them. The remaining screen is placed at the front entrance, and is viewable by students, staff, teachers, and visitors upon entering and leaving the building. The system is used to keep people abreast of in-class news and extracurricular activities such as school trips, sport team performance, and interscholastic competition rankings. Ease of use was also a key selling point for Hormisdas-Gamelin in adopting Mirada’s ChannelView digital signage system. In just a few minutes, users can log into an intranet site, prepare the text, add images, and publish their content. Remi Racine, one of Hormisdas-Gamelin’s vice-principals, enjoys the ChannelView system, and says that “the system is easy to use and almost no training was required”. In addition, should any changes to the school’s content be required, modifications can be made in real time via the user-friendly ChannelView system without disrupting the display and cycling of content. 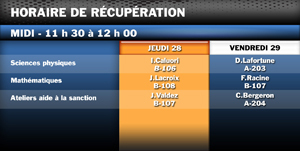 École Secondaire Hormisdas-Gamelin offers many vocational and training programs in addition to its general education (grades 7-11) offering. These programs can be consulted at http://web.cscv.qc.ca/030/. For more information about this press release, please contact Mirada Media at (514) 789-1989 or visit www.MiradaMedia.com.